In the event of a discrepancy, please rely on the school board website and Facebook page! WHEN WEATHER FORECASTERS ARE ANNOUNCING THAT A MAJOR SNOWSTORM IS APPROACHING, WHY DOESN’T THE SCHOOL BOARD CLOSE THE SCHOOLS BEFORE THE STORM ARRIVES IN OUR AREA? Answer: Please remember that the one element that can never be predicted with 100% accuracy is the weather. This means that the decision to close the school system cannot be taken hours before a storm arrives in our territory for the simple reason that past history has clearly demonstrated that forecasters have been incorrect, particularly in the prediction of snowfall amounts and ice conditions. 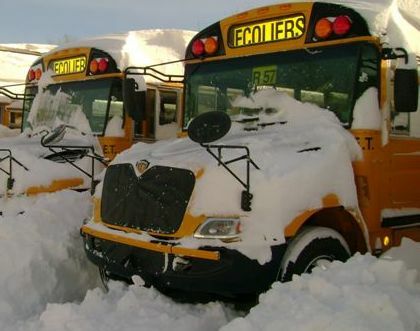 The decision to close or open a school system must always be taken at the latest possible time for bus transportation. WHO DECIDES ON THE CLOSING AND WHAT IS THE DECISION-MAKING PROCESS? Answer: This decision is made once the consultation with bus contractors, designated key drivers, transportation superintendents, senior administrators and other school boards on our territory is completed. A rigorous process begins at 5:00 AM with key ETSB bus drivers and reports from our transporters. By 5:45 AM consultation with school boards on the ETSB territory in the Estrie, Montérégie and Centre du Québec areas is underway with the final decision being made once many factors have been taken into consideration. The ETSB is continuously following the weather reports, to be ready to put this process into action as the need arises. Due to the vast territory that the ETSB covers the decision is never an easy one. Weather conditions can be very different in one part of the territory over another. The decision is made taking this into account, but if a parent feels that the conditions in their area are less favourable, they may decide not to send their child to school. Ultimately it is the parent’s decision and the school board respects that decision. WHAT IS THE LATEST POSSIBLE TIME TO DECIDE ON CLOSURE OR OPENING? Answer: The latest time possible to close the system is 6:15 a.m. After this time, buses have commenced the pick-up of students for transportation to the schools. Once the routes have started, student will not be taken back and dropped off at home. IF SCHOOLS ARE CLOSED WILL THE DAY BE MADE UP LATER IN THE SCHOOL YEAR? Answer: The School Board, in consultation with the teachers’ union, builds into the school calendar 3 days for such a possibility. There is no reluctance on behalf of the Board to use these days; however, if the Board was to exercise this option every time a storm is forecasted, these days could be rapidly depleted. The Ministry of Education has a clear stipulation that cannot be changed, and that is the minimum number of instructional days for students is 180. For this reason, the administrative decision to close the system must be cautious and must fully weigh all possible consequences. The security and safety of students will always be the main priority for the School Board and ultimately that is the final deciding factor. WILL THE SCHOOL BOARD INFORM ME IF THE SCHOOLS ARE OPEN? Answer: The school calendar is adopted by the Council of Commissioners for the next school year. Only if there is a school cancellation will the information be posted on the ETSB website and Facebook page, and disseminated through the media. WILL DAYCARES REMAIN OPEN WHEN SCHOOLS AND CENTRES ARE CLOSED? Answer: When schools are closed daycares do not operate and therefore are closed as well.